A third person has plead guilty to profiting over $1.5 million in stolen goods from Home Depot in a pawn shop scheme. EDGEWOOD, Md. 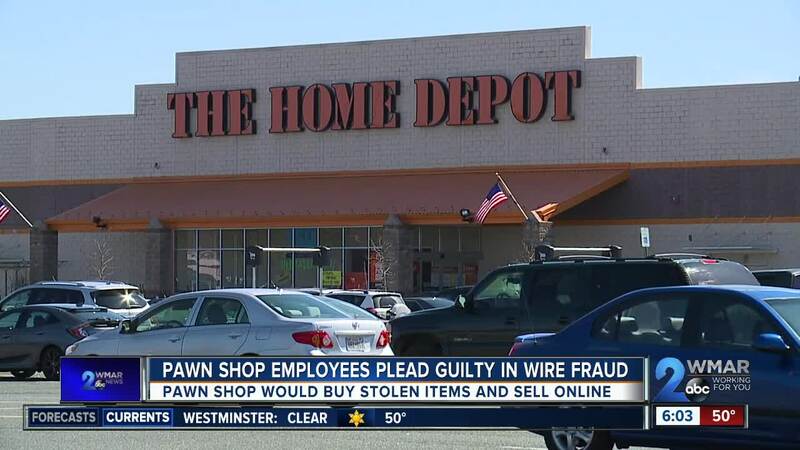 — A third person has plead guilty to profiting over $1.5 million in stolen goods from Home Depot in a pawn shop scheme. According to the United States Attorney for the District of Maryland, 55-year-old David Gutman pleaded guilty to a wire fraud conspiracy that was connected to Chesapeake Pawn Brokers in Edgewood. Two other defendents, Marina Gelfen and Dmitry Babich had previously pleaded guilty to the same charge. According to plea agreements, Gelfen and Babich owned Chesapeake Pawn Brokers and Gutman was an employee. The three were involved in a scheme that started January 1, 2015, and continued through July 8, 2018. The trio would pay cash to 'boosters', a common term for shoplifters, in exchange for stolen items from Home Depot. The plea agreement says they would buy items that were exclusive to Home Depot like Makita, Ryobi, Ridgid, and other brand power tools, to include drills, wrenches, saws, and lithium batteries, even though they knew they were stolen. The products were usually new and still in the original boxes. They would buy the products from the boosters at a price far less than their retail value and then they would sell them on eBay, with the payments being made through PayPal. The conspirators would sell the items under at least 11 different eBay usernames, including the names of relatives and associates, so they could conceal the high volume of transactions, according to the plea agreement. From January of 2015 through May 2018, those eBay accounts recorded over $1.5 million in sales. Gelfen and Gutman admitted to paying boosters over $70,000 for stolen products and Babich paid them over $11,000 during the year he was part of the conspiracy. Between July 2015 and July 14, 2018, an undercover Harford County deputy posed as a booster at least five times saying they brought in stolen Home Depot items. The trio took all of those items, knowing they were stolen, and sold them through eBay. Since Chesapeake Pawn Brokers is a licensed pawn broker business, they are required to enter all items sold into the Regional Automated Property Information Database (RAPID) within 24 hours. RAPID is a tool used for tracking transactions to guard against the sale of, and to aid in the recovery of, stolen merchandise. The plea agreement says the conspirators did enter many of those sales into the RAPID system, even thought they knew they were stolen. As part of their plea agreements, Gelfen, Gutman, and Babich are all required to forfeit any proceeds or property obtained as a result of the scheme, and to pay restitution totaling $132,605.30.